You're never too young to start building your vast swarm of robotic minions. Taking over the world requires a whole lot of robots. The sheer volume of robots needed means your first wave will have to be made of cheap materials. After they take over key resources, you can upgrade to Kevlar and titanium. 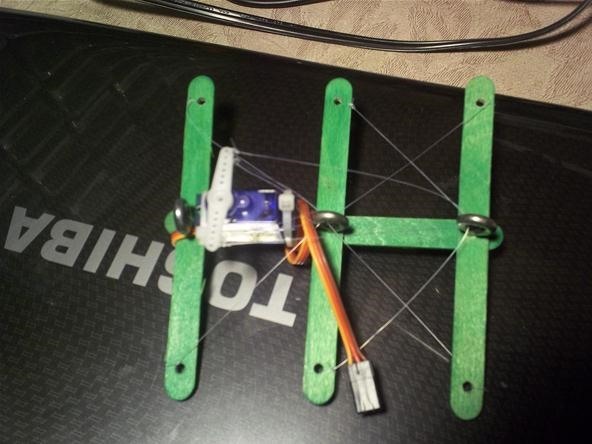 But to start, let's make popsicle stick insect robots! Credit goes to the Frankes for the original idea. 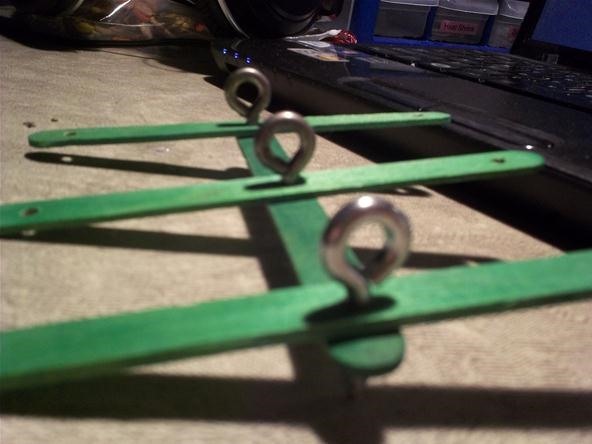 Place three sticks perpendicular to the middle stick so that they form a 6 legs. 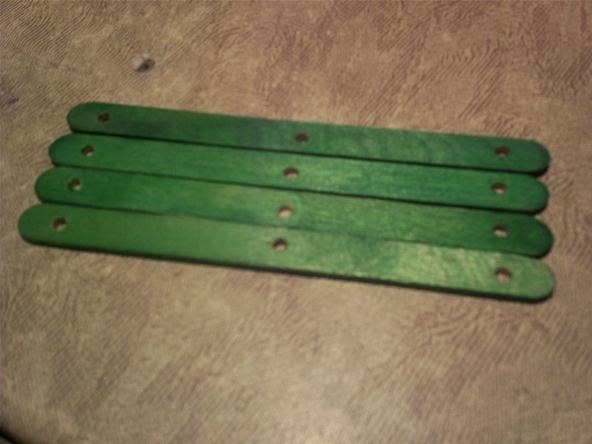 Attach each to the middle stick with an eye screw. Be sure the eye is on the upper side of the body. The upper shaft of the eye screws have no threads, allowing the sticks to rotate freely. Your back eye screw will not guide any ligaments, but serves only to attach the back most legs. 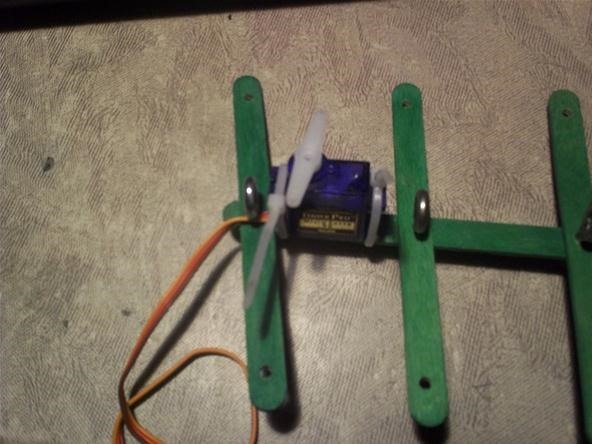 Place your servo between the middle and back legs on the upper side of the body. Be sure the motor shaft is positioned farther back than the rest of the servo. Secure the servo to the body using zip ties on either end. Zip ties are a magical thing you can never have too many of. Be sure to clip the extra plastic off of the zip ties to avoid interference with the ligaments. Follow the diagrams below to attach the fishing line to the legs and servo. The most important thing to do is to make sure all the lines are taught when the servo is in the center position. This is what the final product will look like. Thread a pipe cleaner through each hole on the ends of the sticks. 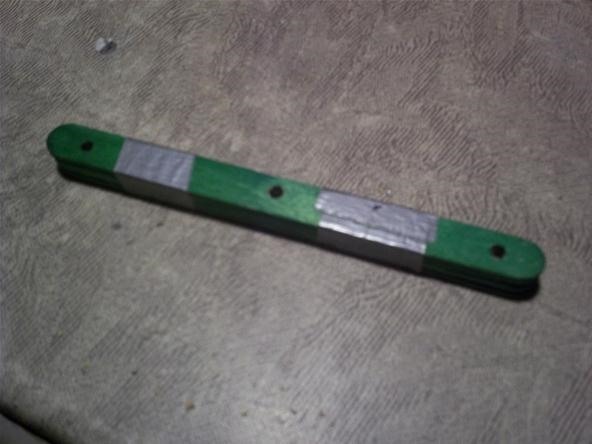 Wrap the excess length around the stick several times to create a sturdy connection. Once all of the feet are connected, bend the ends to adjust them all to the same height. When the servo is in the center position, all the feet should be touching the ground. This can take a little patience. 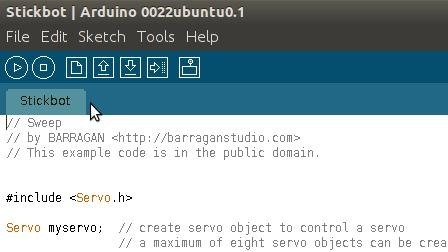 Plug the Arduino into your computer, open the Arduino program, and load this code. Plug your ground and power wires from your Arduino into the ground and power sockets on the servo. Plug pin 9 on your Arduino into the yellow or white socket on your servo. You may have to reload the code to get the stickbot moving. I decided to add a scary face to my robot. 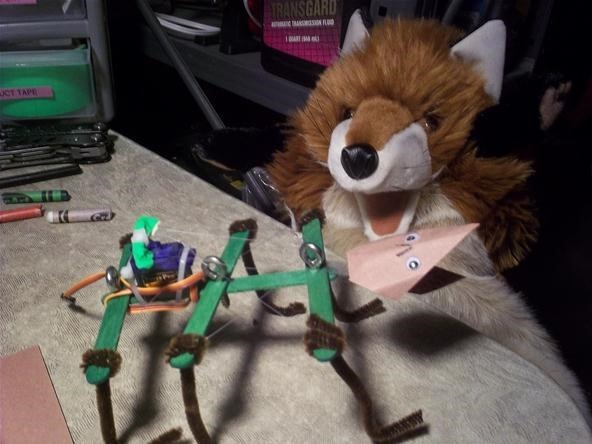 The fox puppet had never seen a robot before. 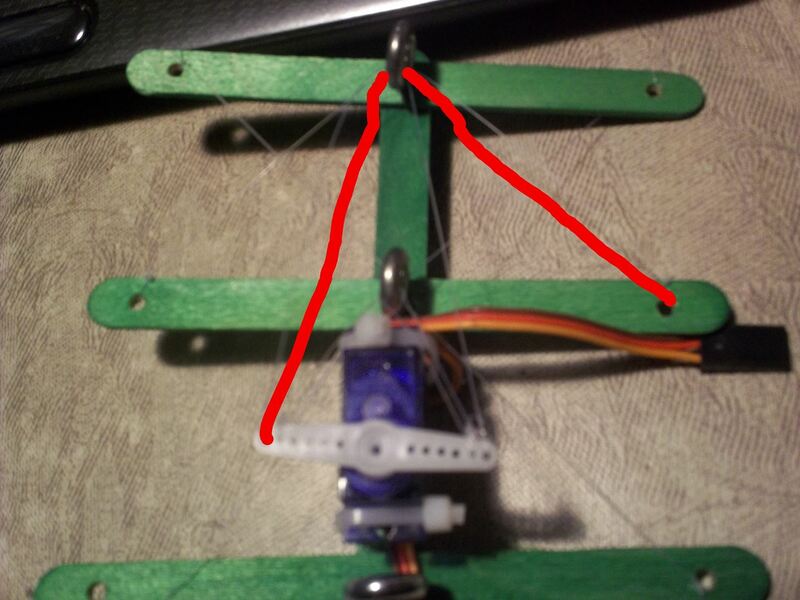 You can do tons of modifications to improve this robot. How fast can you get yours to go? How deadly can you make it? Post up your ideas in the forum so we can all make a giant robot swarm together. 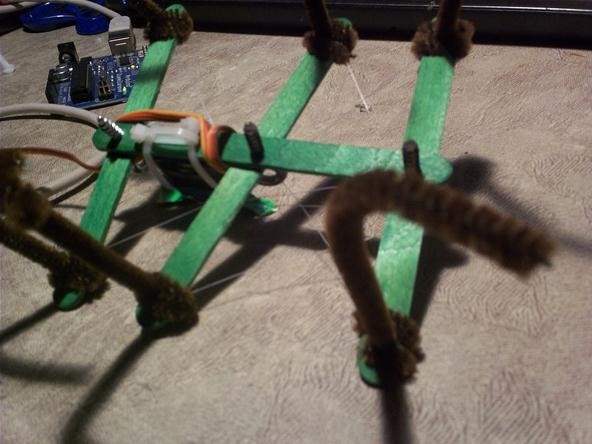 If you take video or photos of your hexapod, share with us on the corkboard.